23rd July 2015. Delft (NL). So, basically a year has flown by. 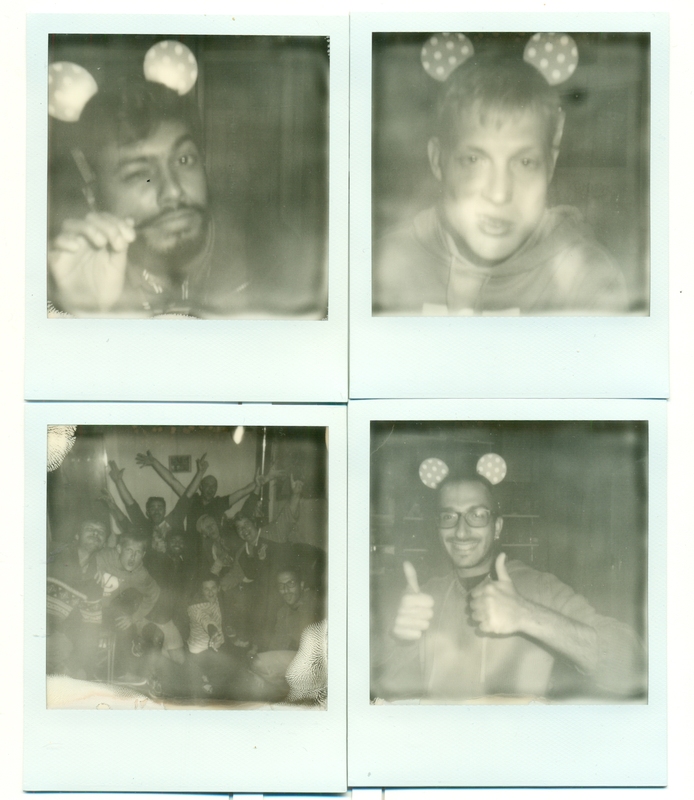 We are finished here in Delft, and which would be the best way for a proper farewell to The Netherlands? Cycling! Let’s have an in-depth analysis of Fabio’s mind a couple of months ago: “Jesus, the flight tickets from Amsterdam to Milan are bloody expensive! No way! What about, Bruxelles as departure… nothing. Dammit! So, what else… Luxembourg? Where the @#!+ is Luxembourg? There it is! It’s not so far… only 30 euros! Cool! But how to get there, train is going to be expensive as well… no way… I’ll get there by bike!” (dialogue copied from the Whatsapp chat between Fabio and his brain, without a chance for it to reply). Pretty straight forward: just get to Maastricht by train and start cycling there, cross the Wallonia region in Belgium into France, some tours in France and Belgium again, and then let’s go to Luxembourg! Easy! This foolish idea has brought the enthusiasm of other sufficiently crazy participants: Piyush and Josias. 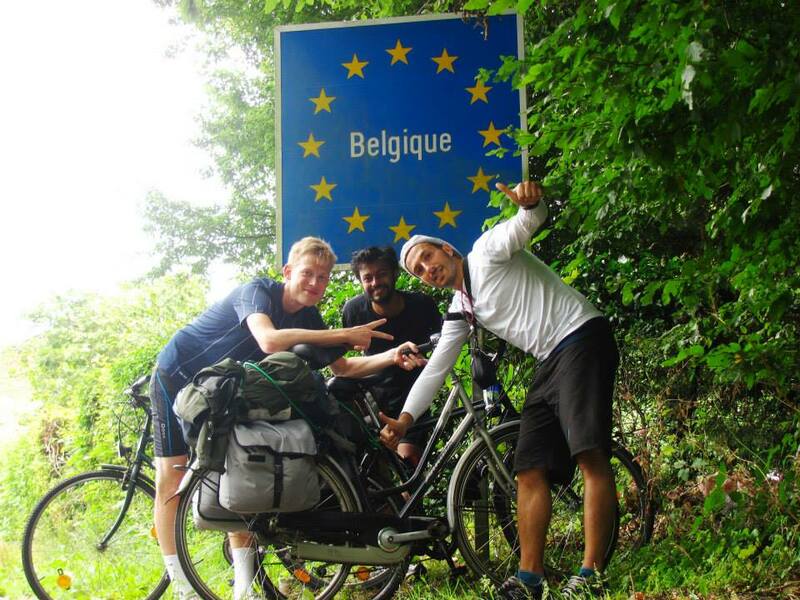 For the Indian this is probably going to be a unique experience to join a bike trip in Europe, and the tall German is not new to improvised adventures, he has the experience of coping with the unforeseen. Such a great team, the “Green Team”! Almost complete with all of its members, since Amy is not coming with us… but the tent she’s giving us will be a kind of replacement, a signal just like: “Guys, this is going to be AWESOME!”. A good plan needs a leading thread. So the pillars of this journey are two important things in our life: friendship and beer. Engine on our mission are the rediscovery of slowness, the beauty of the open air world and its empty spaces, meeting new people, the unknown directions… fuel for the engine is going to be the beloved drink that has given us many and many satisfactions. As far as we know, Belgium is pretty famous for cycling, chocolate, the Smurfs and the Trappist beers… how about visiting them? Here we go: Notre-Dame de Saint-Rémy’s abbey at Rochefort and Notre Dame d’Orval at Orval. Furthermore, in order to live a complete engaging experience, no hostels or anything like that… only tent and Couchsurfing! 24th July 2015. From Delft (NL) to Maastricht (NL) by train and cycling to Visé (BE). 15 km. This trip seems to be a challenge, none of us is in good shape and, most important, we do not have suitable bikes to ride such long distances! Improvisation is the name of the game, so Josias has borrowed his bike from Feroz and Piyush is riding Kong’s. The departure day is the morning after the farewell party we had with the great friends we met in Delft. Since it ended around 4:30 with a crawling Piyush trying to puke into the canal, we cannot really start to ride early in the morning! So, as wisely thought before, the plan is: get on the train from Delft to Maastricht, cross the Belgian border and set the tent at the first comfortable spot in Belgium. Inconveniences. Piyush’s tire is already flat before we leave Delft, we fix it during the train ride. Bike bag with a loose strap, sewn by Josias the tailor-man. Rotten leftovers from the party eaten by Fabio, digested, with some difficulties, but digested. In Maastricht we get off the train, and we start cycling towards the border, that is actually close! So in half an hour we are in Visé, the first Belgian town, lying on the bank of the Meuse River, which is one of the biggest rivers flowing in the North Sea, not far from where we used to live till the day before, Delft. 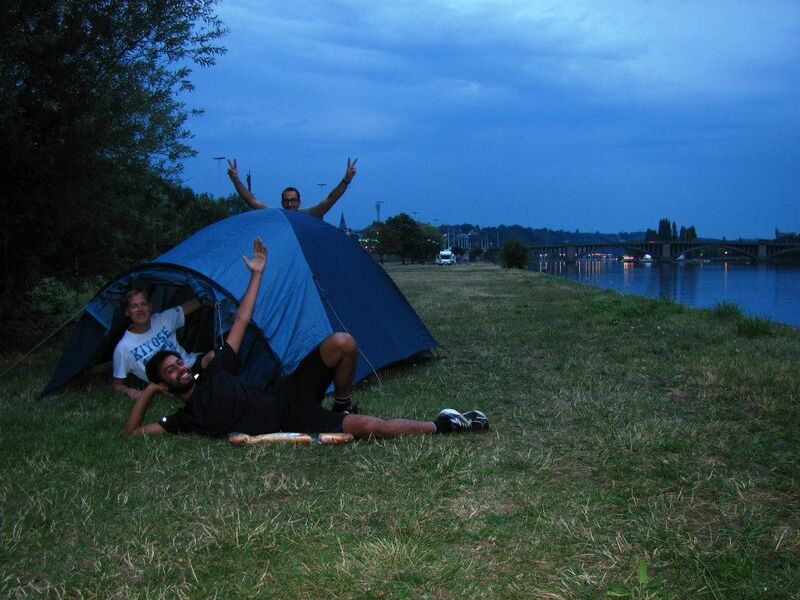 The place where we set up the tent is not more than 3 meters from the river bank. After a quick Risk Analysis, we decide that there are no risks. Nevertheless, what is present, it’s a freaking storm that pours down 150 mm/h (equivalent of about 0.1 Hungs/h) of effective rainfall. 25th July 2015. From Visé (BE) to Durbuy (BE). 70 km. Good morning Belgium! The storm stops, but the weather gloomy and the sky is really threatening. With a lot of effort for the extreme head wind, we reach Liege after 15 km. The pouring rain forces us to find shelter in a sad bar in a suburb, but at least it’s warm while we’re wet. Next to it there’s a supermarket, where we stop by to buy some survival goods. Waiting in front of the entrance a guy looks at us and starts asking for our route. We chat with him in German, French, English and a bit of Italian. His name is Kemo and he’s from Bosnia and Herzegovina. Since we need a pump for our tires, Kemo tells us to follow him towards his place. After pumping up the tires he wants us to take the pump on our journey! We obviously refuse it and as it starts raining in that very moment, his wife warmly invites us upstairs into their apartment for a coffee with the family. Not only coffee, but also drinks and sandwiches. We cannot believe being invited with such a hospitality! Not only being in their lovely place, but also the warmth with which they welcomed us, has heated also our wet bones. But it’s almost 2 pm and we have covered only 20 km of 90km planned for the day. We need to say goodbye. After a nice picture with Kemo’s family, we jump back on our bikes with a lot of new motivation in our muscles and spirits. It stopped raining! We eat piece by piece the bicycle path along the Ourthe, a tributary of the Meuse. The way is suggestive, every half hour wetted by short but strong downpours that we luckily avoid under improvised shelters. After 3 km uphill, we end up in what is the real Wallonia region: countryside with sparse human infrastructure, coloured crops, cows and a lot of god-dammed wind that reminds us very much of our recent Dutch past. This is Wallonia. Getting lost around, we figure that it would be impossible to reach Marche-en-Famenne, the town where we planned to stop for the night. We divert towards Durbuy. Great choice since it is downhill, it’s full of nice places where we can eat and it’s a nice medieval village. 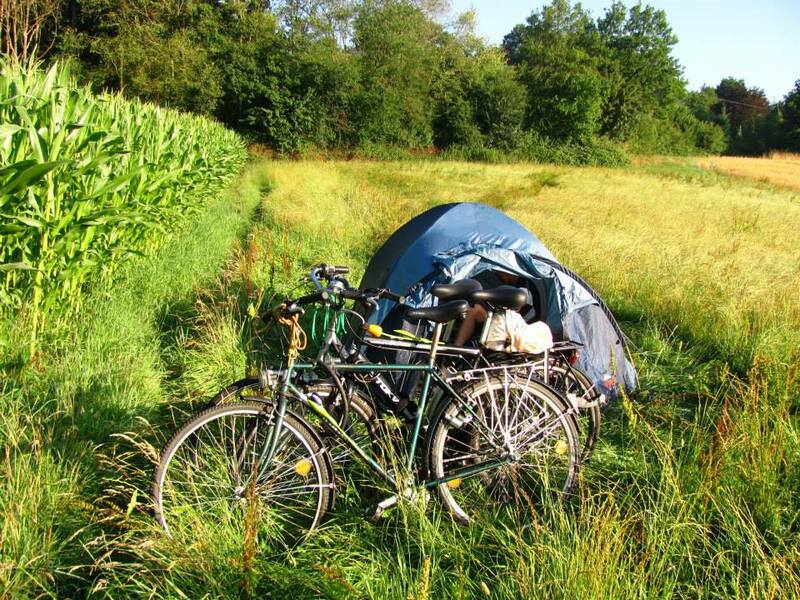 We find a spot for our tent next to a corn field, far from curious eyes. After all, we are camping here illegally. 26th July 2015. From Durbuy (BE) to Givet (FR). 72 km. We wake up after the coldest night of the last 30 years in Belgium: 8°C. But at least the sun is shining! 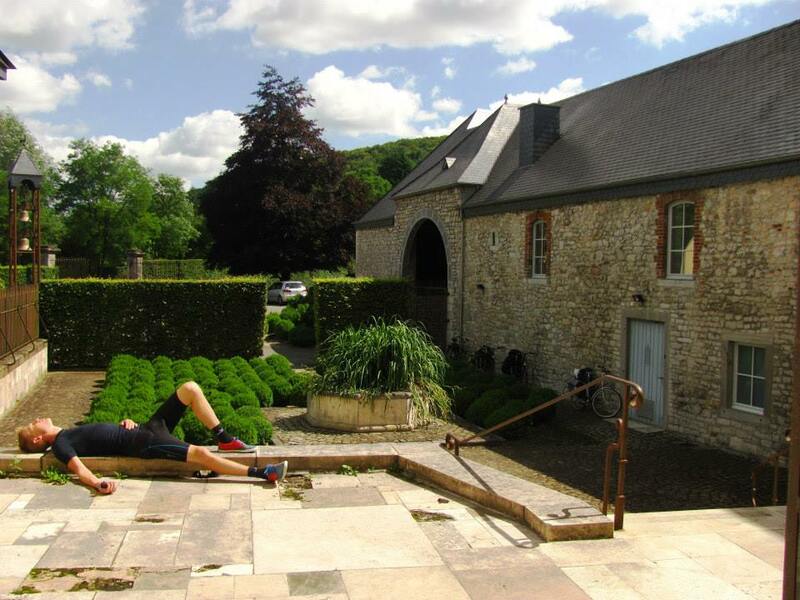 Our mood is high, also because we are eager to reach our next destination, the Rochefort Abbey, where we can finally drink our deserved beers! Making plans on Google Maps is pretty easy, but it’s also easy to underestimate the longitudinal profile. Especially if you try to avoid too many steep uphills, without being worried at all about little hills. Many little hills. Many little hills and head wind. Many little hills with head wind and heavy bags. @#§£. We get lost, but the “three Kings comet” leads us to the Abbey. Closed on Sunday. But there is the holy liturgy. We take advantage of the cosy situation for a half an hour of meditation which means taking a nap on the porch in front of the church. At the end of the mass, we try again to knock at the entrance door. There’s a skinny and lovable man, he opens the door with a comfortable smile. Our hearts melt. He says that the brewery is closed on Sunday, and the monastery cannot be visited since it’s a private place accesible exclusively by monks for their religious life. Nevertheless, he sells us a little box of beers, with one gifted by him personally. We love him. The man shows us in a little private garden, where in peace we can taste God’s drink. We love him even more. After having celebrated our holy moment, a deep meditation starts again. The man wakes us up from our thoughts. We say goodbye to him, but two monks come out from the abbey’s portal. With a large smile they start to chat with us. How can we miss this opportunity? Thanks to the amazing French-speaker Josias, we can communicate with them. The monks are pleasantly surprised that we are three friends of different nationalities. They invite us to take a look inside the abbey court, we can observe the brewery building and the private cloister where they pray. Peace and gratitude are the only sensations that we have in this moment. But it’s now moment to leave, it’s getting too cloudy and it doesn’t look good. 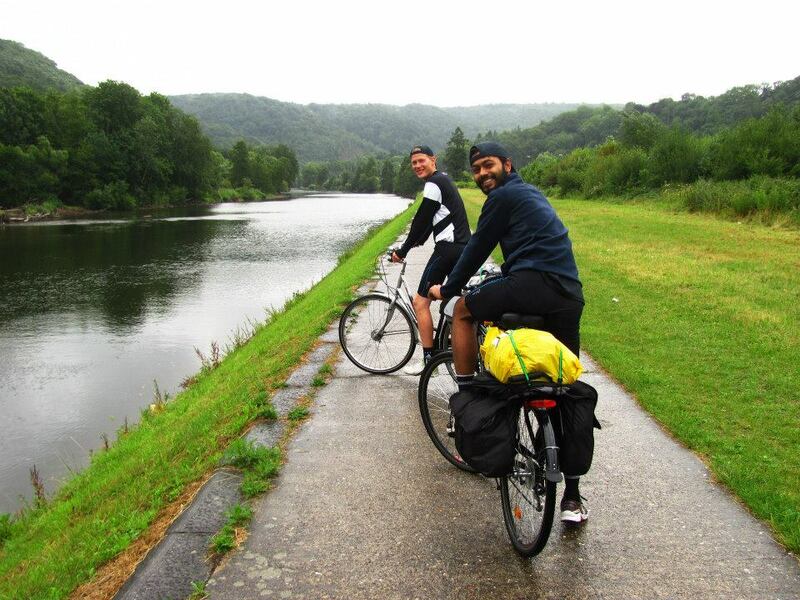 We salute the monks again, and we start to ride towards Givet where we’ll be hosted by Xavier, our first couchsurfer. Last 20 km under an annoying rain, we have kind of missed that. Finally we arrive, completely wet, at Xavier’s house. He’s an amazing person, that welcomes us like old date friends with a dinner that, my God, “awesome” is reductive. It is as simple as tasty: vegetables baked with honey and melted goat cheese… unbelievable! He knows a lot of things about medical herbs and with these he also produces his own liquors that, of course, we taste listening at his great LP collection. Best way to end this great day, thank you Xavier! 27th July 2015. From Givet (FR) to Charleville Mézières (FR). 75 km. We begin our day without hurry. And it starts to rain. Again. Despite the not promising start, the weather gets better. The sky clears up, and from the broken clouds sunlight beams colour of green and blue onto the amazing landscape of the Ardennes. The Meuse river moves sinusoidally meandering through the lush valley. The cycling path runs along the bank and we hardly see any cars. Most of the time we feel the nature surrounding us, with the constant presence of our favourite element in its placid and continuous state. It’s like to cycle in a postcard. On our way we meet an adventure park. “Shall we see what’s going on there?”. “Oh yeah buddies!”. Smart French people, they have named a one-person-cross-valley-ropeway as “Fantasticable”. Do you get it? It’s genial! Isn’t it? Anyway… 50 seconds flying over the Meuse with a 32 teeth smile stamped on our faces, almost touching the top of the trees next to us rushing down at high speed. Luckily a big elastic stops us before we crash. THAT WAS AWESOME!!!!! But oh no, it’s late and we have a long way to get to Charleville-Mézières, where Gaelle, our second couchsurfer, is waiting for us. We ride sticked together to break through the air and thus be faster. Our bike trip has now turned in a race. Josias has cramps, Fabio’s bike is heavy with large bags that look like sails, Piyush is too light and the headwind could send him back (sorry bro!). But our efforts are soon finished, we arrive in town. And we get lost. Gaelle comes to pick us up and leads us the way to her place. She does not live alone, it’s a kind of hippie community! People are arriving, others leaving which confuses us a bit in terms of who is living there, who is visiting and who is just randomly dropping by. We meet Lucas and Vera who are working on a van to set up to be their home on four wheels for a journey on the road in the French Britain; we meet Zebu who doesn’t really speak English, but she’s able to be understood in a funny way; Nicolàs, with a never ending smile. We cook 2 kg of pasta, one third eaten by us. In the meantime Lulù and Vincent arrive to bring further vivacity, happiness and trash music. The “Vodka of the friendship” starts to travel from one to another. In 10 minutes our dinner has transformed in a wild party. Three hours of nostalgic and powerful songs danced like there’s no tomorrow, even though everyone says: “tomorrow I have to go to work at 8!”, while we ask: “do you guys always finish your dinners like this?”. At 2 in the night, the tiredness comes with no mercy and we collapse on the mattress. 28th July 2015. From Charleville Mézières (FR) to Virton (BE). 90 km. ur impression is that at Orval the monks have made a real business with their beer, but we might be wrong. By the way, the abbey was founded in the 12th century, and with centuries later had become more and more important. And rich. So one day Napoleon came and destroyed everything, blaming the monks of having given hospitality to the Austrian a rmy. At the end of the 19th century started the reconstruction of the current abbey, with the ruins of the old one still visible and really beautiful. After an interesting visit at the ruins, it’s time to buy some beers. A box of six, just to have some weight more to bring to Virton, the destination of our day, where Mailys is waiting for us. 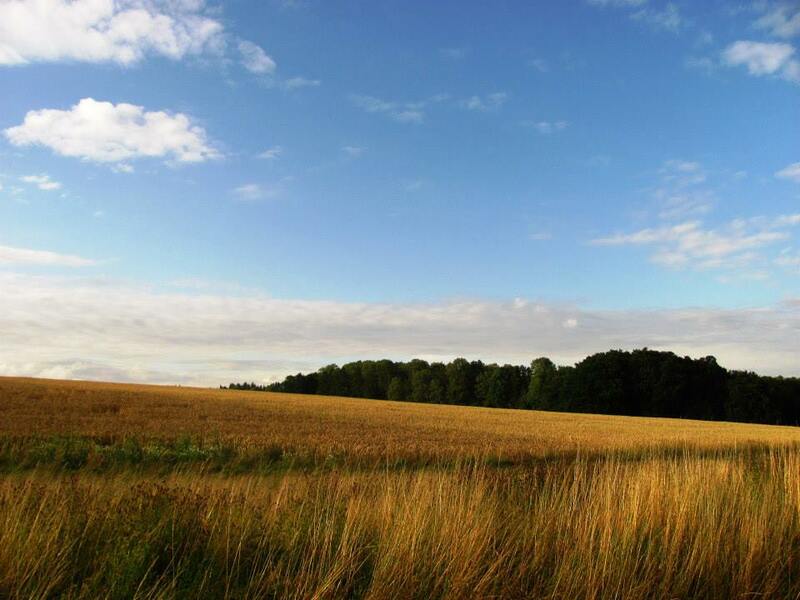 Actually we have to go to a little village 7 km far from Virton. This dammed village is at the top of a steep hill that kills our legs entirely. But we made it! Mailys is really friendly, we give her the beers we bought and she gives us the same beers but cold from the fridge. Good deal! We cook our usual bucket of pasta that we eat avidly, but we are polite enough to have nice conversations with our couchsurfer. Unfortunately for her, we are tired like hell, we cannot do anything else than going to sleep. Piyush prefers to try the hardness of the living room floor, me (Fabio) and Josias share the bed in a tiny room 2×3 meters without window. Deadly trap for the poor German that the day after will name that experience as the loudest night ever, due to the snore of the Italian mate. 29th July 2015. The end.